On seeking the 2020 vision, Aruba’s utilities started their own efficiency projects, introduced renewables into the power production, and also new DG regulations, while government implemented tax incentives on renewables and also appliances, with a certain efficiency grade. We looked for strategic partners, to help us in our 2020 vision, and two renowned, “not for profit” organizations, TNO and Carbon War Room, joined us. 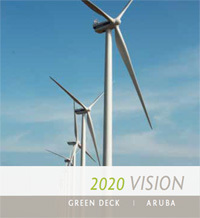 While Carbon War Room aid us creating the “Smart Growth Pathway”, TNO developed several studies, leading off with the “Roadmap Sustainable Aruba 2020”. Other partners also included, Rocky Mountains Institute, Harvard University and the University of the District of Columbia.